One of the few professional speakers who can transform the presentation skills of others, she is an executive speech coach and sales presentation skills trainer.Kiplinger’s Personal Finance wrote that one of the best investments in your career is Patricia Fripp’s presentation skills training. Patricia simplifies and demystifies the process of preparing and presenting powerful, persuasive presentations. She can deliver her message in a keynote speech, breakout sessions, through interactive virtual training, and in-depth customized training and coaching. Fripp is a past president, and the first female president, of the over 3,000-member National Speakers Association. She is a member of the highly prestigious Speakers Roundtable, an invitation-only group of highly regarded professional speakers, authors, and consultants. She is the author of Make It So You Don’t Have to Fake It! and Get What You Want! and co-author of Speaker’s Edge, Speaking Secrets of the Masters and Insights Into Excellence. Patricia is now virtually everywhere with FrippVT.com, her interactive, learn-at-your-own-pace, virtual presentation skills training. Fripp Virtual Training’s Powerful, Persuasive Presentations is a multimillion-dollar, state-of-the-art, web-based training platform that emulates live training and coaching. It is almost as if Patricia Fripp were sitting right there with you. Host Susan Finch interviews Patricia Fripp, the woman with boundless energy and bottomless wit to get to the heart of the lost sales issue. It happens every year, salespeople are behind in quota, competitive sales that should come to you slip through your salesperson’s hands. The problem is that you very seldom know why. and fires and earthquakes in the west. It’s all a bunch of hooey because salespeople can’t diagnose themselves and sales managers seldom visit the field enough to know what the real problem is. Until now. 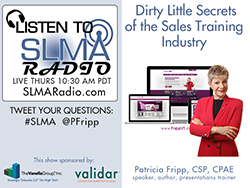 Patricia Fripp, the sales presentation skills trainer gets to the heart of the issue. When your message must be memorable, your presentation persuasive, your sale a success call Fripp. Patricia is virtually everywhere with FrippVT.com. Keynote Speaker, Executive Speech Coach, Sales Presentation Skills Trainer, Virtual Training Expert Fripp helps organizations and individuals gain a competitive edge through powerful persuasive presentation skills. 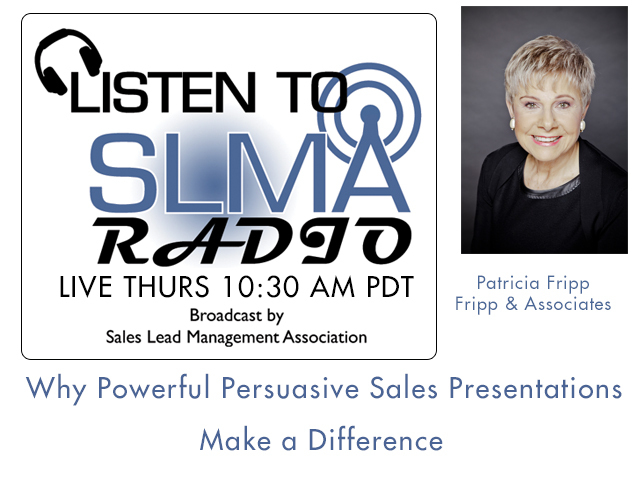 Patricia Fripp is the ultimate authority on powerful persuasive presentations - your competitive edge! She is a Hall of Fame keynote speaker, executive speech coach, and sales presentation skills trainer and coach. Meetings and Conventions magazine named her "One of the 10 most electrifying speakers in North America.” Kiplinger's Personal Finance wrote, "The sixth best investment in your career is to attend a Patricia Fripp speaking school." Fripp is now virtually everywhere through her interactive virtual training www.frippvt.com. Trusted by clients such as ADP, Cisco, VMWare, IBM, VISA and Genentech. Patricia is a past president, and the first female president, of the over 3,000-member National Speakers Association. Long term success, Patricia Fripp says, doesn’t depend on how smart you are, but how well you speak. 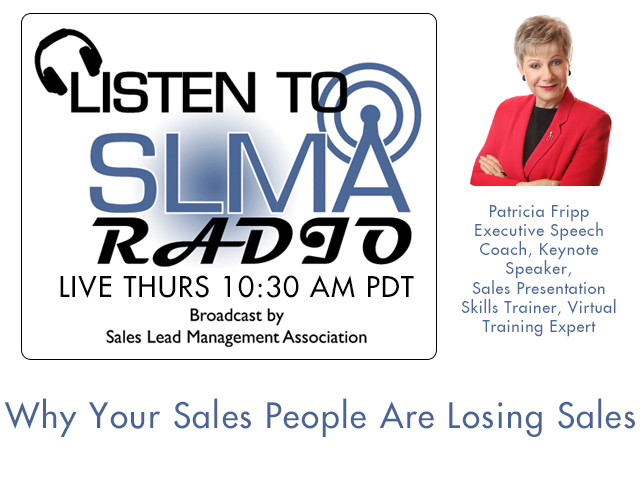 Obermayer the SLMA Radio host said, “As a sales manager I knew that I can control and teach a lot of things but every time a salesperson opens their mouth, there is no telling what will come out. Marketing people are worse because they generally don’t speak for a living.” In this interview, the preeminent speaking coach tells it like it is and will convince you why a speech coach is just good business. Patricia Fripp and her expert associates are the ultimate destination if you want to improve the quality of your public speaking, sales presentations, or you are looking for a keynote speaker for your meetings, conventions, and corporate events. Other services include interactive virtual training and PowerPoint creation and coaching.